Marketing has brought cars with music together for decades. Ads like Cadillac’s infamous Break Through spot featuring the energy of Led Zepplin along with a strong Baby Boomer emotional appeal or the wholesome goodness of Dina Shore singing “See the USA in your Chevrolet” all have their place in automotive and music history. Some things never change, as there seems to be a surge in music and automotive marketing. It seems all brands – luxury and non-luxury – have found some sort of alignment with the passion music brings to a product and with so many genres of music and so many vehicles with different audiences finding the right fit may be easier than ever. One of my favorite integrations comes from Volkswagen’s European Seat brand featuring Shakira. The campaign is developed around one song: Good Stuff. The Seat Good Stuff website is full of music, cars, games and chances to win tickets. Sharkira’s wild hair and long legs take prominence over the Seat Ibiza, which even has a Special Edition Good Stuff model to align with the campaign. Of all the current music and automaker integrations this is the only one that has built a car for sale to the public. Seat gets the prize for having not only the most elaborate, fanciful site but they also integrated things to the product level with tinted windows, iPods, and 16” “Sonda” wheels. The campaign is further connected through a Good Stuff Facebook fan page that currently has 3,748 fans. Like most campaign Facebook sites there is very little engagement, especially from the brand as the team in charge only posted one wall post back in February. Overall the integration is well executed, minus the lame attempt at a Facebook presence, with plenty of artist and vehicle alignment. 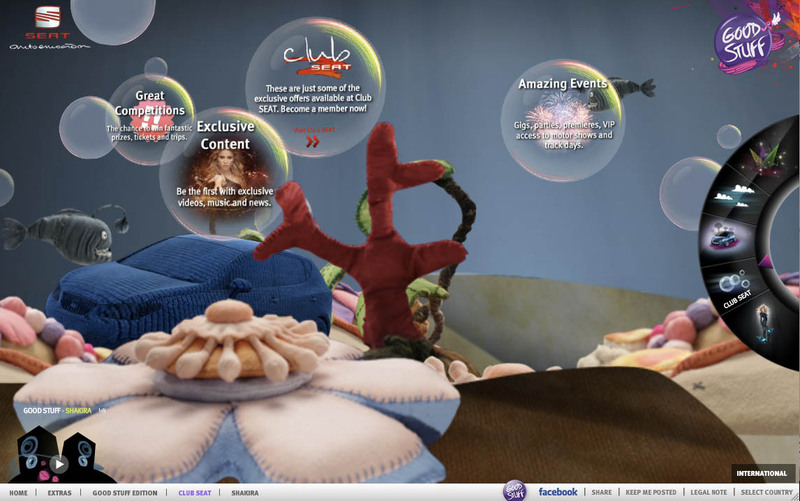 Bringing the experience online further strengthens the brand’s sponsorship of Shakira’s European Tour. The site has several links to listen to music, find chances to win concert tickets, extend alignment with the brand through Seat’s Club Seat member website, and let’s users easily share the content with others through common social networking sites. Going after a completely different demographic than Seat, Chrysler Group’s new Ram Truck brand wants its potential customers to write letters to America’s soldiers at war. 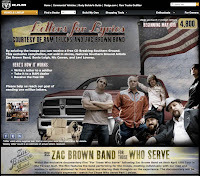 All letters will be collected at Zac Brown Band concerts and Ram Truck dealerships. "This unique endeavor is derived from respect and admiration, from both the Ram Truck Brand and Zac Brown Band, for the men and women in the military," said Marissa Hunter, Head of Ram Truck Brand Communications, Chrysler Group LLC. "It is our hope that these letters serve as a source of appreciation and comfort." 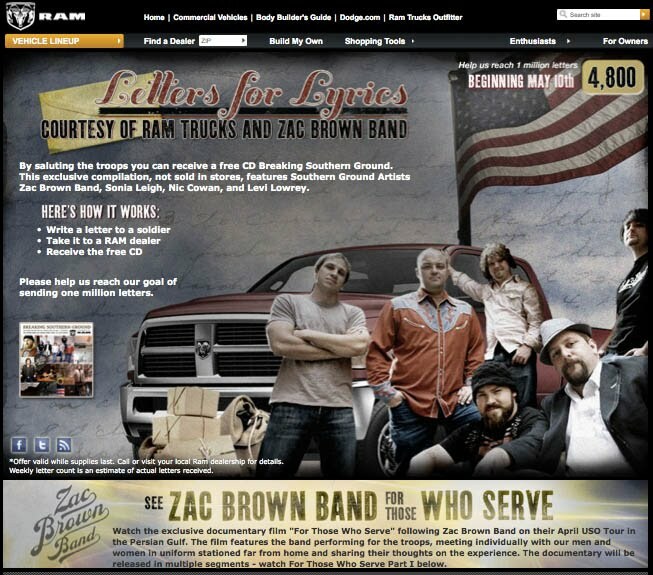 In exchange for the letters, Ram Truck will give letter writers a free special Zac Brown Band CD entitled "Breaking Southern Ground." Early this year our team at Lincoln launched the Lincoln Music Experience Sweepstakes along with a Lincoln branded Music micro-site (in full disclosure: I’m the digital brand strategist for the Lincoln and Mercury brands at Team Detroit, in case you didn’t read my bio.) Over the past three years, music has played a significant role in the re-branding of Lincoln. The ads feature a space themed design treatment and usually a reinterpretation of a classic 80s song by a breakthrough brand. 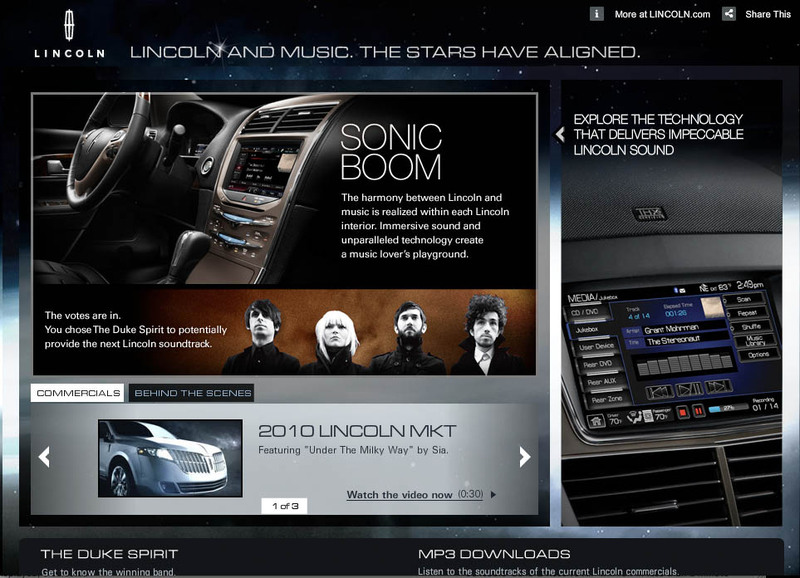 To further extend Lincoln’s affiliation with music, the Lincoln and Music website originally was designed to promote a sweepstakes where one could win a Lincoln vehicle and tickets to see the band Shiny Toy Guns. Site visitors can also download music, explorer Lincoln’s THX II sound system, and had an opportunity to vote to choose the next up and coming band for the next Lincoln commercial. These three examples show how a variety of brands are using music to tell their product or brand story. Each vehicle segment also appeals to different target consumers and finds ways to reach out to potential customers through contests or giveaways. All are driving consumers to the vehicle shopping pages and include some sort of social media link sharing. Since this is also about music, every site includes at least one downloadable MP3 music file to take the brand’s sound with its visitors. Hi,I have visited your blog it was really great! !..keep it up.I wanna bookmark your blog in my browser.. It is really a good idea to promote a brand through song. If a song is presented by some well known celebrity than that brand will automatically need no advertisement and that brand will have good demand. I think this is one of the best idea of promoting product. That too if there is celebrity in song than product will surely get good demand.